@drglow with the latest update, if you were maxed out level 58, you should be able to upgrade your tents and farms. To advance to level 59 unlocking council. @drglow I would suggest you click on every building to see if there's any update you missed. The max before the latest update was level 58. @drglow did you take a break from the game? 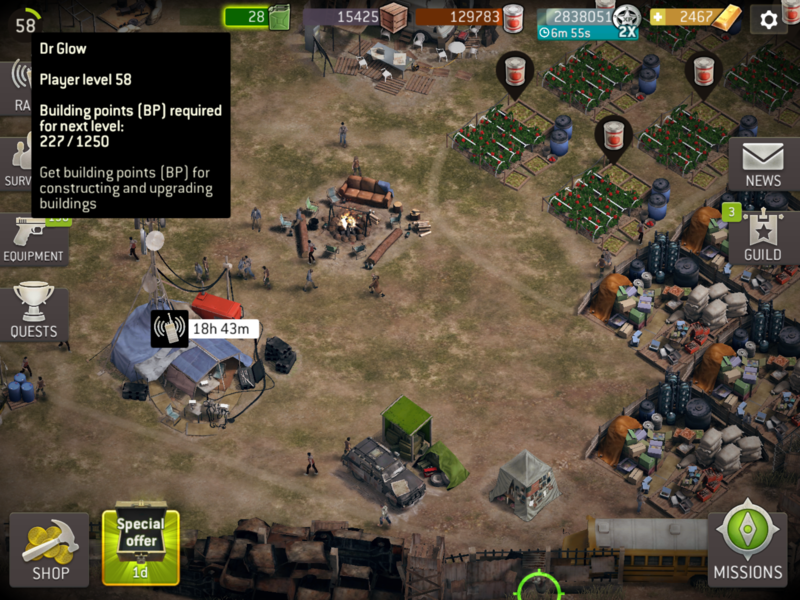 Could you post a screenshot of your camp with the player level clicked to see how many BPs you have? @drglow send an in game support request. Did you take a break from the game? The BP issue was fixed a few updates ago just wondering. If you can do me another favor and list the number of buildings and the level just to see if anything pops out but 227 is really an odd number. What about the walker pit and outpost? Didn't see that on your list ... could be the missing buildings to reach lvl 59. Walker pit max lvl is 9 and lvl 5 for outpost. Apologies for duplicating a response. Whether you actually play the Outpost or not, you'll have to upgrade the Walker Pit and Outpost some to increase your player level. Note that you don't gain any BP from "upgrading" the walkers in the pit itself. @drglow welcome issue resolved, closed.